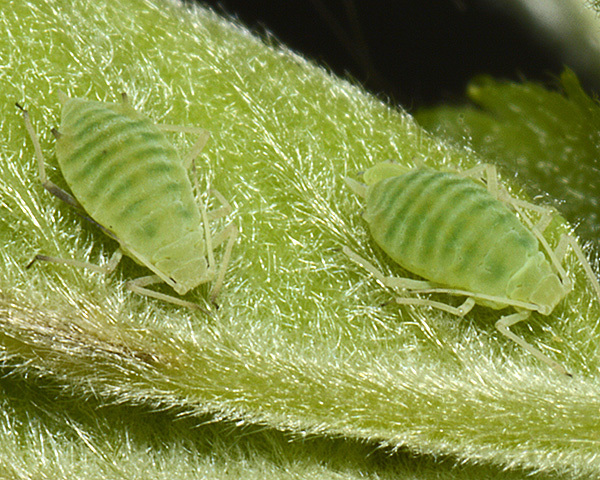 Longicaudus apterae are generally pale coloured, small to medium sized aphids. The siphunculi are cone-shaped or cylindrical. With one exception (Longicaudus naumanni) the siphunculi are shorter than the cauda, often much shorter (less than half the length). The siphunculi may be absent in fundatrices. The cauda is finger-shaped or tongue-shaped. There are eight species in the Longicaudus genus, most host alternating between rose (Rosa) and members of the buttercup family (Ranunculaceae). The aptera of Longicaudus trirhodus is pale yellowish-green with slightly darker green transverse bands across the abdomen. The third antennal segment is distinctly longer than the total length of the fourth and fifth antennal segments. The siphunculi are cone-shaped with dark tips and much shorter than the cauda. The cauda is long and finger-like much longer than its basal width. The body length of Longicaudus trirhodus apterae is 2.0-2.7 mm. The alate (second picture above) has broad dark transverse sclerites on abdominal tergites III-VI, more or less fused into an irregular-shaped quadrate patch. 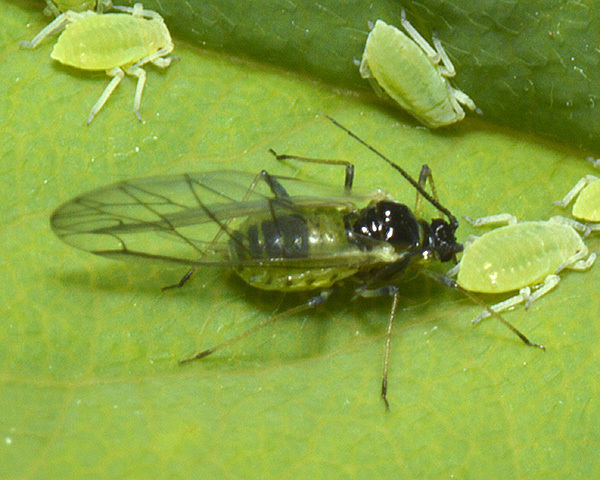 The rose - columbine aphid host alternates from rose (Rosa spp.) in winter and spring to cultivated columbine (Aquilegia vulgaris) and meadow rue (Thalictrum) in the summer. Longicaudus trirhodus is found Europe, Asia and North America.